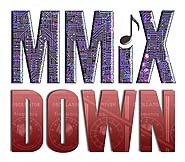 BY BOB KRASNER | If you feel the need to simplify composer Patrick Grant’s long-running “Tilted Axes” project, you could call it a marching band for electric guitars. But given the complexity of the compositions and the dedication of the musicians, that description falls way short. 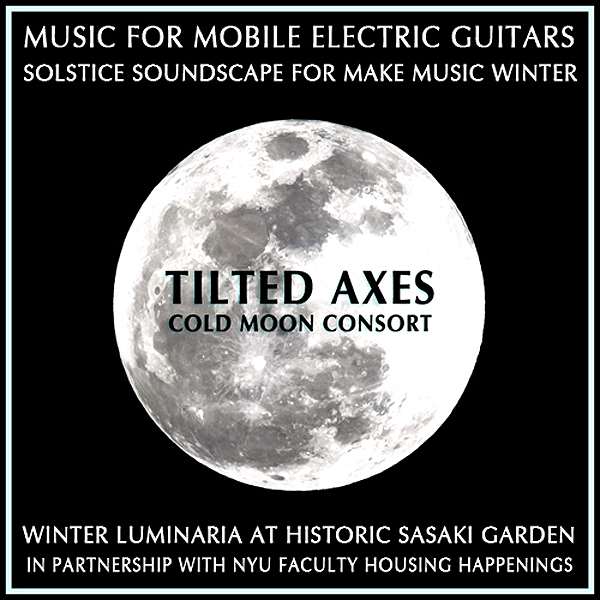 The latest performance of Grant’s “Music for Mobile Electric Guitars” was realized by 24 musicians, including Grant, on the winter solstice, in the Sasaki Garden at Washington Square Village, “The Alamo” at Astor Place a.k.a. “The Cube” and the streets between. Tilted Axes: Music for Mobile Electric Guitars – Cold Moon Consort (Patrick Grant center with, L to R, Chad Ossman, Michael Fisher, Sam Weisberg, Sean Satin, Dan Cooper, Howie Kenty). The event was commissioned by Faculty Housing Happenings at New York University — where Grant is a professor — as part of “Make Music New York.” The confab featured music evenly divided between older pieces, structured improvisations and premieres written specifically for Friday night. One of the new pieces, “Tiltinnabulation,” was written to include another Make Music group, “Bell By Bell.” According to Tom Peyton, the leader of that multigenerational group of bell ringers, they were notified that their path might cross with “Tilted Axes” and they were given the choice of avoiding each other or playing together. “It was like a ‘West Side Story’ gang meet-up, with music and camaraderie and solstice celebration love,” she said. Composer Patrick Grant at “The Alamo” with his “Tilted Axes” performance group. Carrying an electric guitar and an amp through the streets while playing somewhat complex music is a daunting task, but the participants found it more than worthwhile. “The universal joy of the people we encountered on our parade route caused me to transcend the discomfort I felt at not being fully in command of the music, the weight on my back and shoulders,” David Demnitz said. Grant made it through the balmy evening with a case of laryngitis that forced him to hoarsely whisper directions to bassist Sarah Metivier Schadt, who amply conveyed his instructions to the crew. Please visit THE VILLAGER and support the great journalistic work they do. Sasaki Garden in Washington Square Village through Greenwich Village and back. Event begins at 5:00pm and runs 120 minutes. Positions in the ensemble are limited. Please apply ASAP. Please share. Composer Patrick Grant and Tilted Axes: Music for Mobile Electric Guitars, in partnership with NYU Faculty Housing Happenings, present an evening of innovative musical performance featuring a procession through Greenwich Village that begins and ends with a solstice soundscape in honor of Sasaki Garden set aglow with enchanting lights. The evening’s musical commission is titled “Cold Moon Consort” in reference to 2018’s winter solstice and the December full moon occurring within the same day. Arrive at Sasaki Garden at 5:00pm and receive a small flashlight to participate in the spectacle and illuminate the performance route. 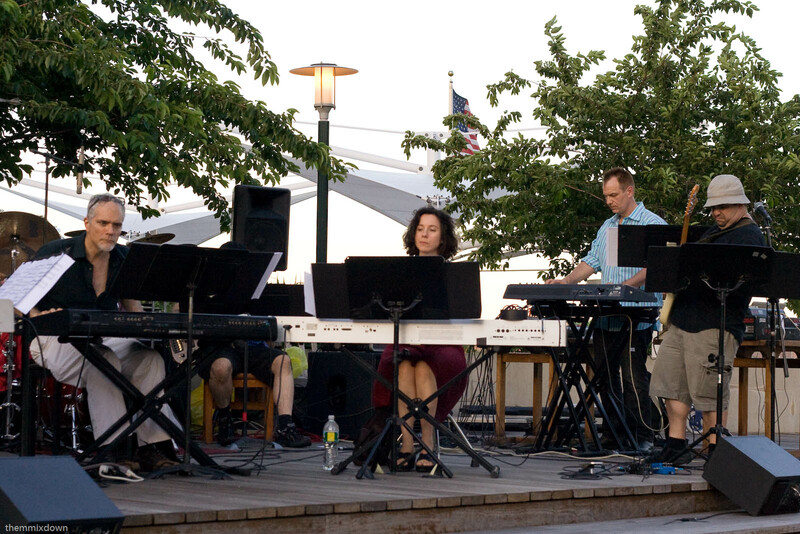 The music procession kicks off in Sasaki Garden, located in Washington Square Village, just north of Bleecker Street and west of Mercer Street, at 5:00pm and wends its way throughout Greenwich Village before returning to the garden for the finale. Just arrive at Sasaki Garden by 5:00pm to receive a small flashlight to participate in the spectacle and illuminate the performance route! 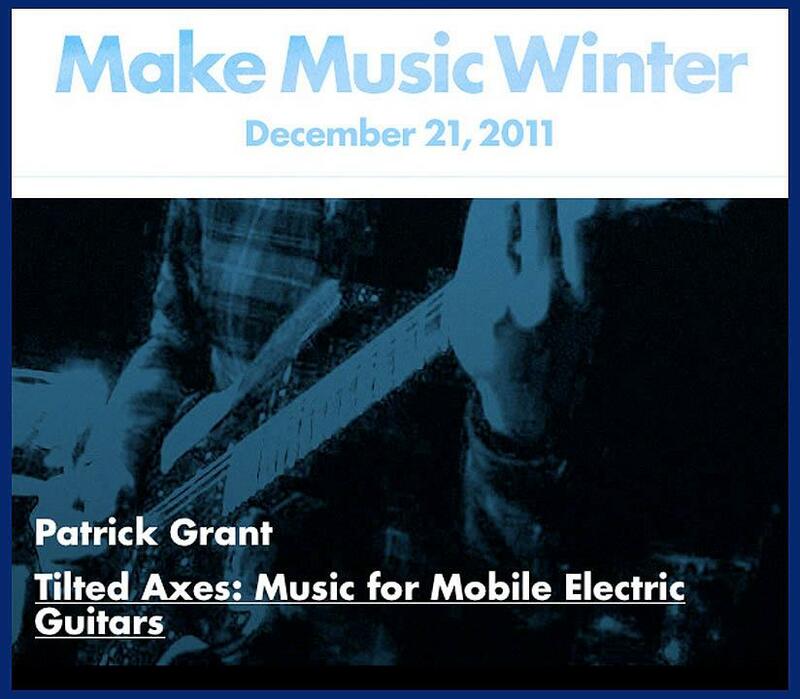 Tilted Axes was created in 2011 for the inaugural Make Music Winter festival by Detroit-born, NYC-based composer/performer Patrick Grant. 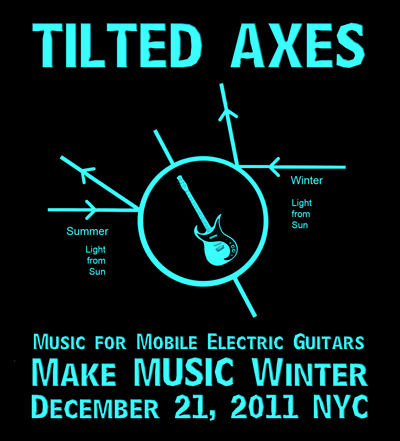 Tilted Axes cuts musical pathways through the urban landscape, turning neighborhoods into their own sonic narratives. Since its inception, Grant has produced a number of Tilted Axes processions in various cities upon three continents. For the 1st annual Make Music Winter, notorious composer and producer Patrick Grant creates and leads a “precession” of over a dozen electric guitarists playing through Danelectro Honeytone mini-amps through the East Village, around Union Square, and back. We are very happy to have NYC’s Rivington Guitars as a sponsor and the starting point for the precession and St. Mark’s Church-in-the-Bowery as another sponsor and as our final destination. The public is invited to march along and bring light hand percussion to join in if they wish. The result will be a moving, polyphonic sound cloud layered in compelling, electric rhythms all in honor of this season’s axial tilt. 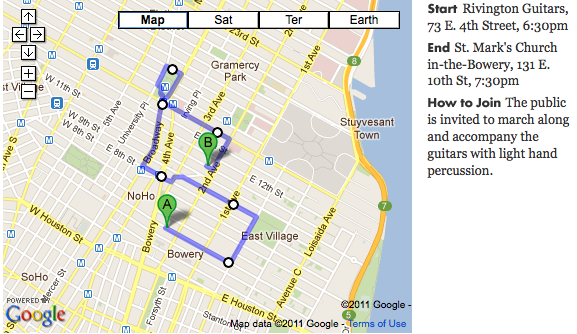 The precession will begin at 6:30 PM at Rivington Guitars, 73 East 4th Street, between 2nd Ave. & Bowery, and will end at 7:30 PM at St. Mark’s Church-in-the-Bowery, 131 E 10th Street, NW corner of 2nd Ave.
Tilted Axes guitarists include: Cristian Amigo, Angela Babin, Alexander Baxter, Dan Cooper, Glenn Cornett, Nick Didkovsky, Toby Driver, Kurt Gottschalk, Randolph A. Hudson III, Taylor Levine, Joshua Lopes, James Moore, Gene Pritsker, Larry Simon, Geremy Schulick, and Patrick Grant. More information and bios for all the participating guitarists can be found at the Make Music Winter 2011 website. We did it and we did it well. 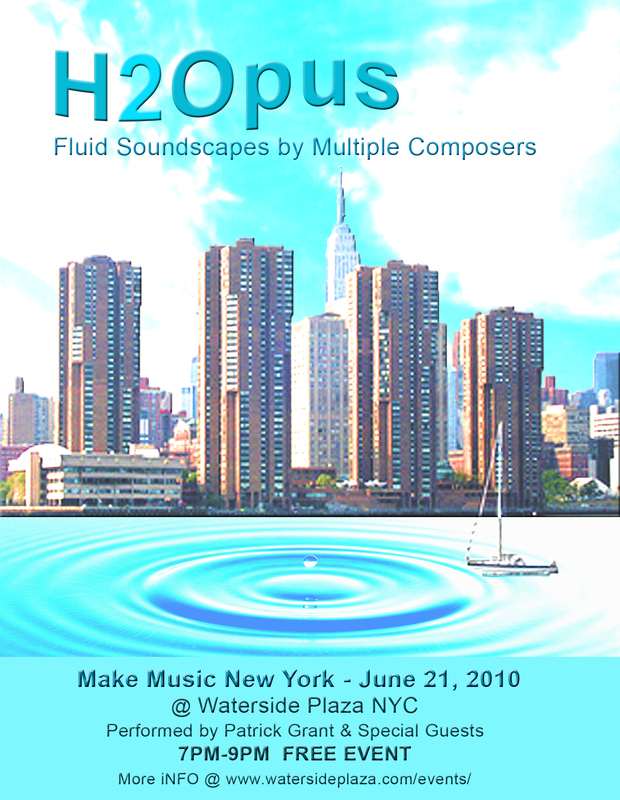 Thank you to all of the H2Opus: Fluid Soundscapes musicians and composers: Lynn Bechtold – violin, Dan Cooper – 7-string electric bass, John Ferrari – drums & voice, Patrick Grant – keyboards & electric guitar, Marija Ilic – keyboard, Joseph Pehrson – keyboard & voice, Gene Pritsker – electric guitar & rapping, Kamala Sankaram – accordion & voice, Kathleen Supove – keyboard, Waterside Plaza and Community Affairs Director Yenneca Ketzis, WNYC Listener Supported Radio for their cultural support, and, of course, Aaron Friedman of Make Music New York who got this whole ball rolling, BUT ESPECIALLY all those in the public who came from near and far, old friends and new, who made this event one of those very rare NYC moments that remind us all why we choose to live here. …video & audio will follow shortly. Thanks again. Summer 2010 in NYC has truly begun!